Date: August 02 , 2018 Time: 7:00 pm - 9:00 pm Location: The Greens Park - On Meridian Ranch Blvd. between Isle Royale and Anacostia Dr.
Tasting and judging will take place during the Wendy Woo concert at The Greens Park. 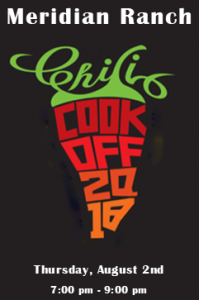 To enter the cook-off, email pepsiduffie@yahoo.com.